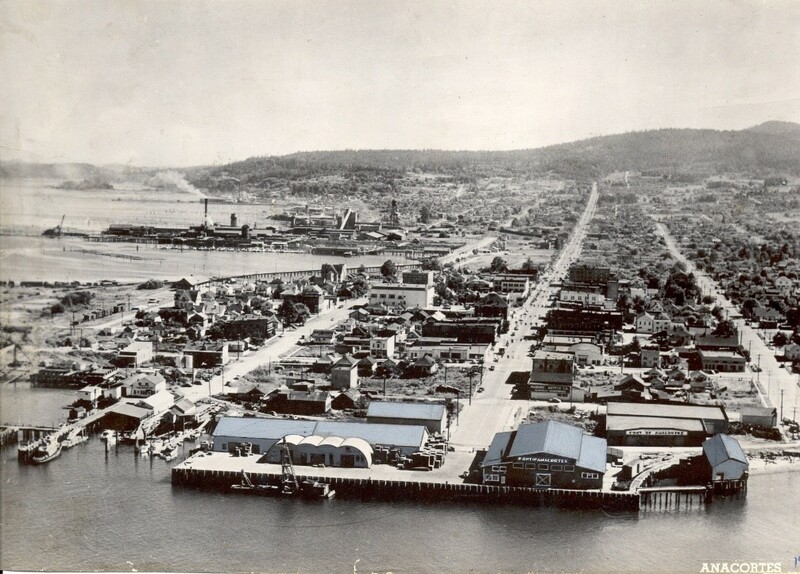 The Port of Anacortes was formed by a vote of the citizens of Anacortes on November 2, 1926. In a document promoting the newly formed Port district’s first bond issue in 1927, Port commissioners W.F. McCracken, Howard J. Sackett and E.C. Howe signed a statement which read in part: “Commercial and manufacturing importance [of the future] will require a great extent of developed harbor on Puget Sound and port facilities …. Anacortes must prepare for it – must make its start now, and no longer be permitted to lag behind its competitors for industry and commerce….The opportunity is here for building a great manufacturing and shipping center.” On August 27, 1927, the bond issue for $93,000 “to acquire the necessary tidelands, waterfront and acreage” and to begin their development was approved at the polls, fostering a new era of economic development. Over the years the Washington State Legislature has periodically broadened the authority under which public ports operate. The Revised Code of Washington Chapter 53 outlines the authority and powers of public ports in Washington State. Today, the Port of Anacortes operates as a special purpose district under the direction of five elected Commissioners. The Commissioners establish policy and employ an Executive Director, who in turn employs staff to carry out those established policies and procedures. In addition to a busy Marine Terminal, handling bulk cargo shipments, the Port of Anacortes operates the second largest and most visited public marina in the state, Cap Sante Marina, as well as the Anacortes Airport and lease properties. The Port of Anacortes is most proud of our stewardship to the environment, completing more than $60 million in environmental cleanups over the past ten years. See our environmental page for further information and current practices. The Port of Anacortes is a municipal corporation of the State of Washington, created in 1926 under provision of the Revised Code of Washington (RCW Title 53 et seq. ), to provide for the development and maintenance of harbors and terminals, promote tourism and foster economic activity in its district. With one of eight natural deep water marine terminal facilities in Washington State, its 1,000+ slip marina, and its roughly 80 acres of commercial properties, the Port is instrumental to the success and economic development of the community. The Port is independent from other local or state governments and has geographic boundaries that consist of Fidalgo, Guemes, Cypress, Sinclair, and neighboring islands, and a small strip of land bordering Padilla Bay up to and including Samish Island. A five-member Board of Commissioners elected for four-year terms by Port District voters governs the Port. The Commission delegates administrative authority to an Executive Director and staff to conduct operations of the Port. The County levies and collects taxes on behalf of the Port as determined by the Board of Commissioners and acts as treasurer for the Port as defined under the RCW 53.36.010. Industrial Development Corporation of the Port of Anacortes. The Industrial Development Corporation, a public corporation, is authorized to facilitate the issuance of tax-exempt nonrecourse revenue bonds to finance industrial development within the corporate boundaries of the Port. Revenue bonds issued by the Corporation are payable from revenues derived as a result of the industrial development facilities funded by the revenue bonds. The bonds are not a liability or contingent liability of the Port or a lien on any of its properties or revenues other than industrial facilities for which they are issued. The Port of Anacortes’ five member Port Commission serves as the Board of Directors for the Industrial Development Corporation. The Port provides quality jobs, international trade connections, a strong industrial land base, and economic stability by producing revenue for state and local services. The Port is authorized by Washington law (RCW Title 53.08) to provide and charge rentals, tariffs and other fees for docks, wharves and similar harbor facilities, including associated storage and traffic handling facilities for waterborne commerce. The Port may also provide freight and passenger terminals and transfer and storage facilities for other modes of transportation, including air, rail and motor vehicles. The Port may acquire and improve lands for sale or lease for industrial or commercial purposes, and may create industrial development districts. The Port of Anacortes is located in Anacortes Washington, roughly halfway between Seattle and Vancouver, B.C. Canada. One of 8 natural deep water ports in the Pacific Northwest, our Marine Terminal is ideally situated on the Guemes Channel. Accessible by land and sea, State Highway 20 connects Anacortes to Interstate 5 that runs the length of the west coast of the United States.